Manchego is possibly Spain’s most famous cheese. This 100% sheeps milk cheese has a zesty and exuberant flavor while its texture is firm but not dry. Manchego can be recognized by the zigzag pattern etched into its rind. This is created bythe rippled surface of the press used in the manufacture of the cheese. Underneath the inedible rind, the interior is ivory colored with few small holes. 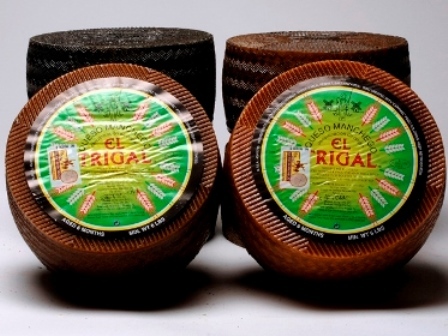 This cheese has been wrapped in sheets of woven esparto grass giving it a buttery and flavorful taste. This cheese can be enjoyed aged at 3 months and 1 year.